a kid in it. And if the kid can’t save it, you get a dog. There is no higher adorability factor. Every perk of the ears, every moist look, is the performance of a lifetime. 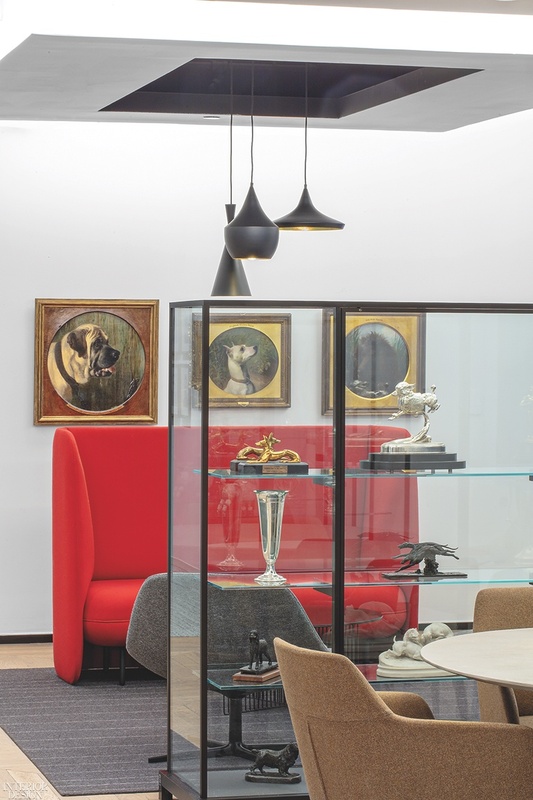 The just-opened American Kennel Club Museum of the Dog, housed in a glass office tower in New York, is testament to that truism. 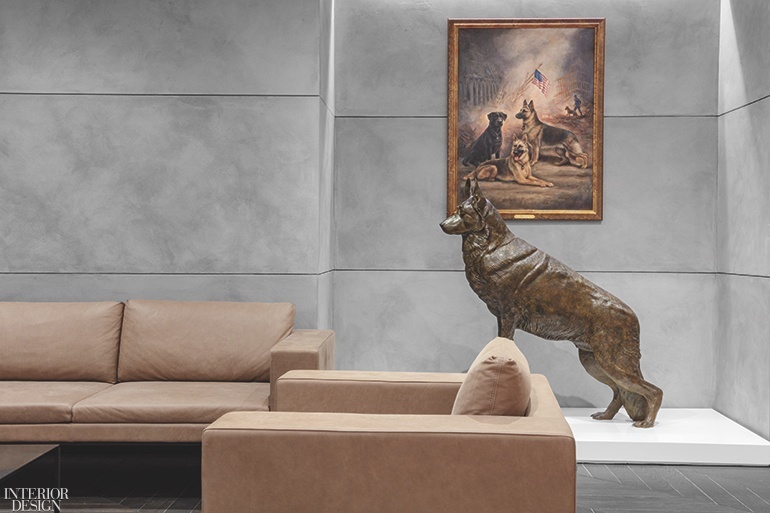 From logo (“Arty,” a blue dog) and fine-art installations to interactive stations and a smartphone app, the two-story Gensler-designed museum is a sells-itself celebration of man’s original Best Friend Forever. As part of the project, Gensler also redesigned the AKC’s office headquarters on the fifth floor of the same building. 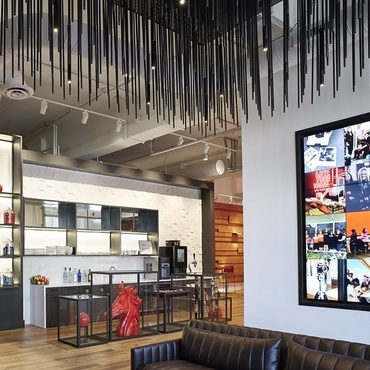 Along with designing the American Kennel Club Museum of the Dog in New York, Gensler also developed interactive attractions such as touch-screen tables that provide visitors with information about specific canine breeds. Photography by Eric Laignel. “Every time they saw their dog, it was like ‘Awwww!’ Every time!” Gensler principal and design director EJ Lee says, describing developers working on one of MOD’s signature interactive features: “Find Your Match,” a pair of kiosks at the entrance that takes visitors’ photos and tells them what breed they resemble. I am a greyhound (gentle, independent, noble). I’ll take it. Lee is a French bulldog (adaptable, playful, smart). True? “Uh, sure,” she says, firmly professional. 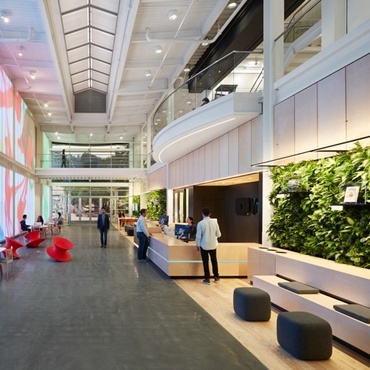 “It was such an immersive project, not just about the architecture,” Gensler principal and creative director John Bricker explains. 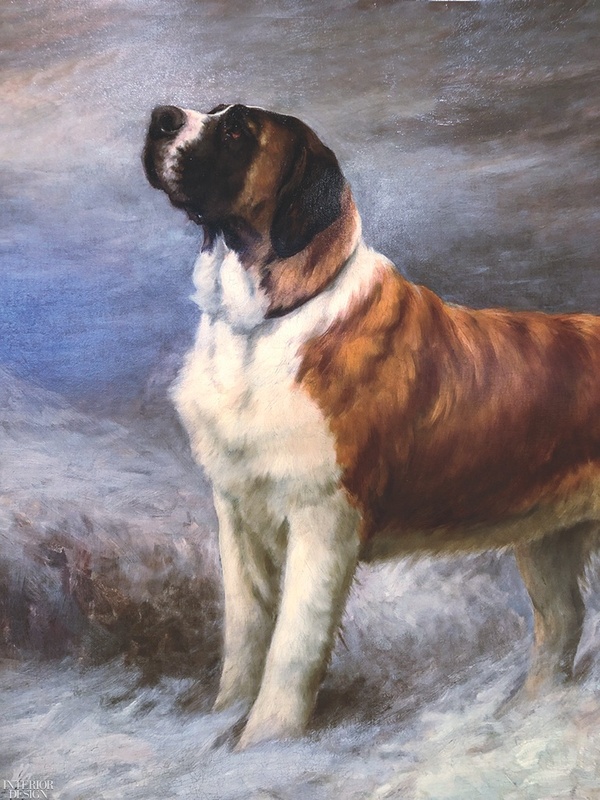 “It was about developing a brand and unique experiences—and also about education, which is what the AKC stands for.” The 135-year-old organization maintains a purebred dog registry, the largest in the world, and is the sports-governing body for more than 20,000 dog events annually (including the Westminster Kennel Club show). Bricker is a Boston terrier. “I’m friendly, bright, and amusing,” he reports. I didn’t ask. 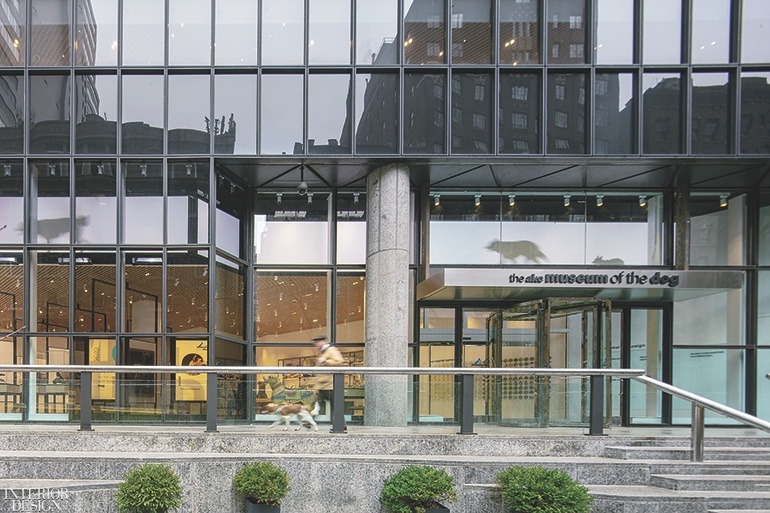 An animated frieze of digitally projected trotting dogs runs across the museum’s facade. Photography by Eric Laignel. English 19th-century painter Samuel John Carter’s portrait of a Cavalier King Charles spaniel with a crop in its mouth: Waiting for Mistress with a Cane. It doesn’t get any more obedient than that. 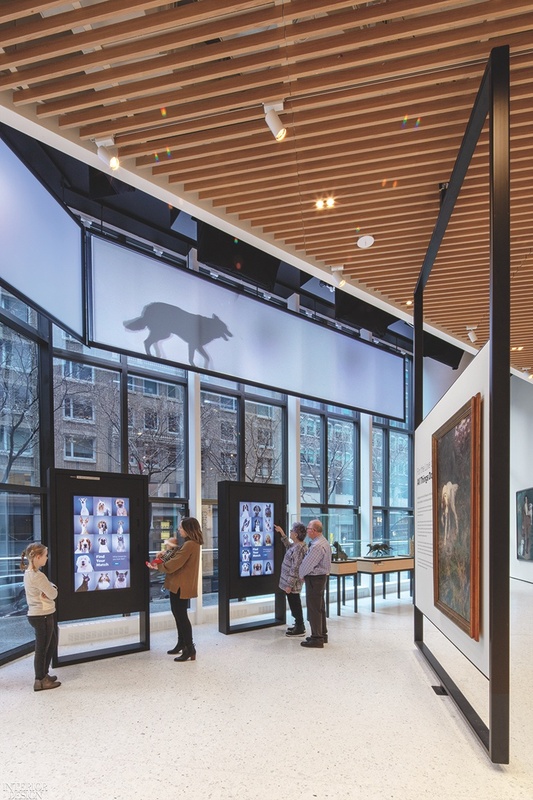 Nearby, another interactive station—“Meet the Breeds,” a touch-screen table—invites visitors to select a dog silhouette and drag it into a kennel, which opens portfolios of information on the type. 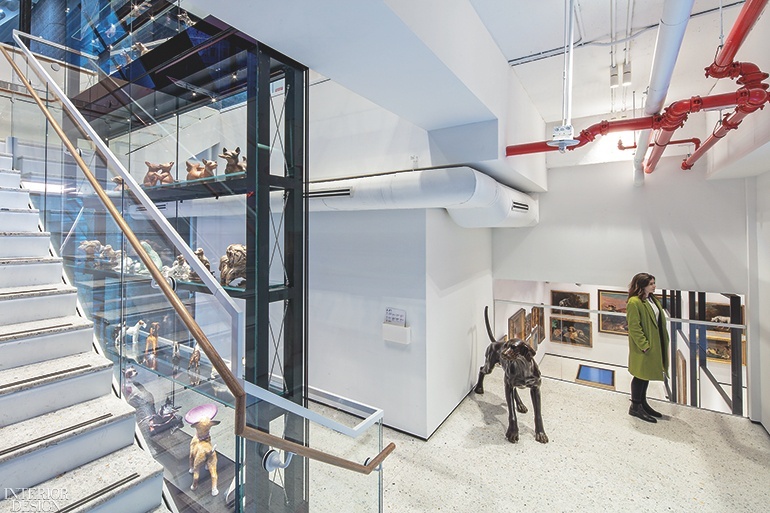 Vitrines for porcelain figurines, small bronzes, spiked collars, a canine war-hero parachute, and every other type of dog memorabilia include a 34-foot-tall multi-tier steel-and-glass case that flanks the open stair to the second-floor gallery. Behind the stair, a corner with views to the street, plaza, and building lobby houses a tiny AKC.TV studio. Overhead hangs an 8 ½-foot-tall wireframe Labrador retriever illuminated by color-changing LEDs—signage that MOD is here. Stay! Windholme’s Spotless is an oil on canvas by Percy Earl. Photography by Eric Laignel. At the top of the stairs, a third interactive feature, “Train a Dog on the Job,” stars “Molly,” a digitally rendered puppy created in (where else?) Los Angeles. She learns to obey voice commands and hand-signals visitors direct at the screen. (With the exception of service animals, every live dog is canis non grata at MOD.) The 7,250-square-foot upper level includes a more than 4,000-volume library and arts-and-crafts stations for family activities such as drawing, coloring, and answering brain teasers involving. . .well, you know what. In redesigning the AKC’s fifth-floor headquarters, Gensler co-opted the building’s problematic, rhomboid shape and turned it into a strength. “I used it as a cue,” Lee says of the angular oddity. 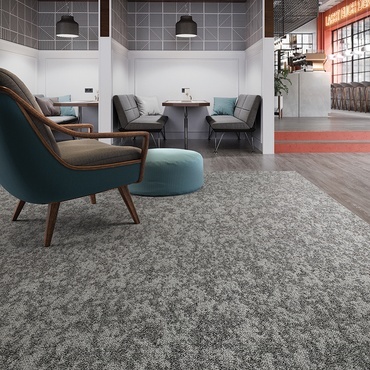 At the core of the layout is a triangular grid, with handsome “boulevards” leading away from the reception desk to the corner work areas. 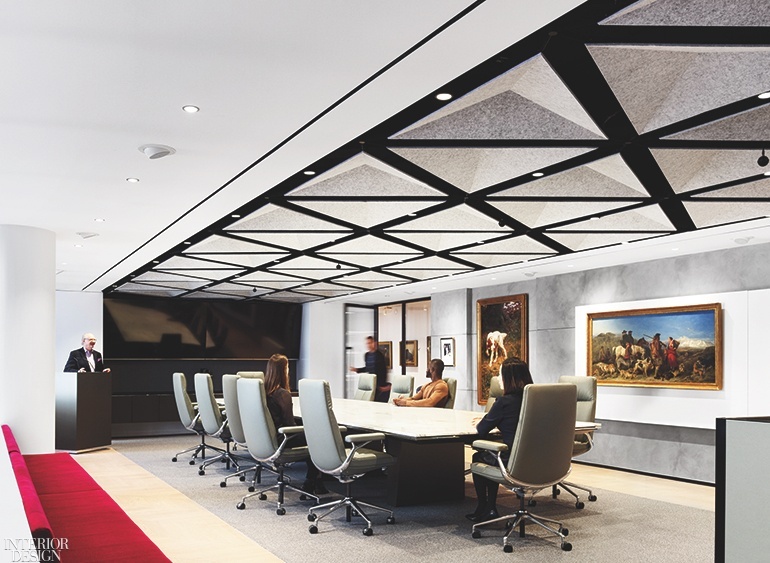 The triangular motif is echoed in fittings and fixtures throughout, such as the conference room’s black-and-white dropped-ceiling grid. 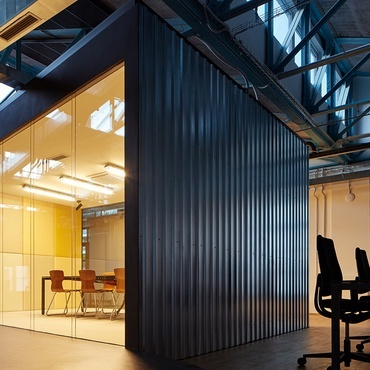 Contrasting dark and light herringbone oak flooring helps define open space and directs movement to various departments. Rotatable steel-frame display partitions supplement limited wall-hanging space in the ground-floor gallery. Photography by Eric Laignel. 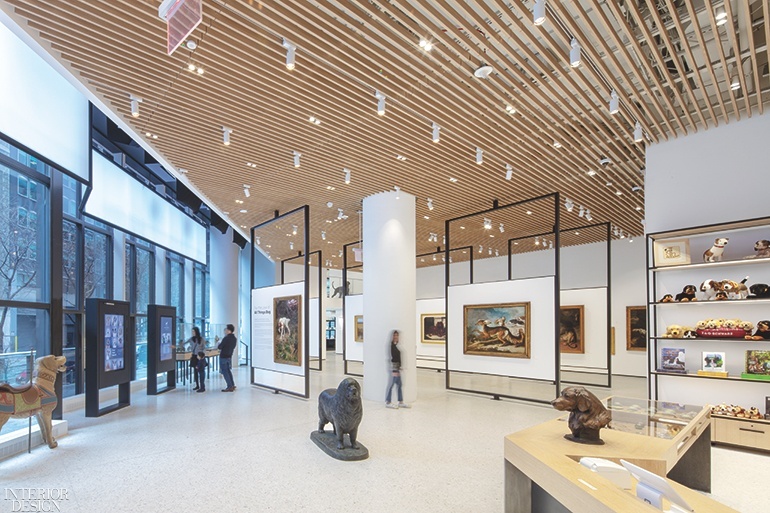 A 135-foot-long gallery wall—the AKC has its own 260-piece art collection—forms one arterial side of the central triangle, like a hedged sight line in a formal garden. 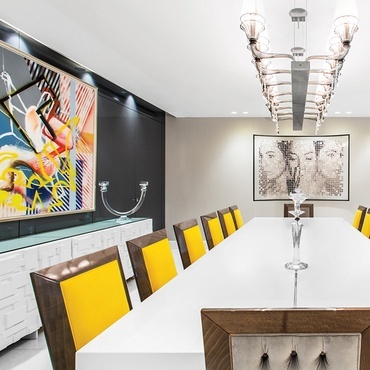 It also sets the materials palette: a play of “antique” and “contemporary sleek,” Lee notes. 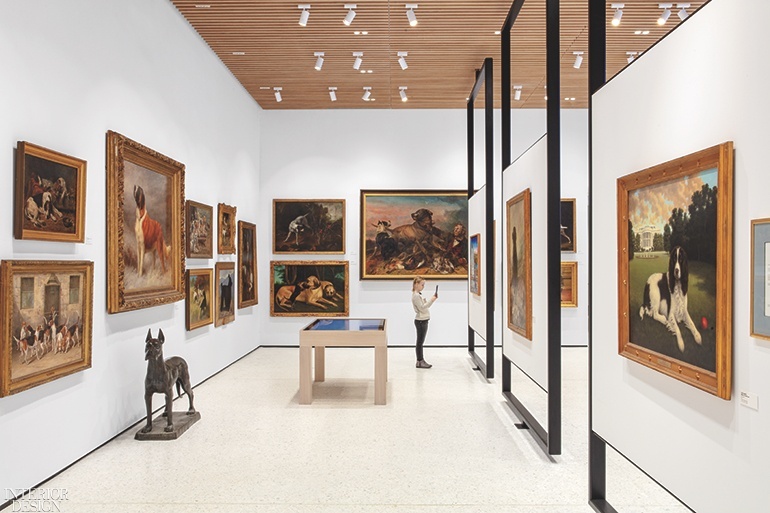 White lacquered panels, which showcase ornately framed paintings, are framed in turn by concrete-finish walls behind them, a juxtaposition of polished and unpolished that suggests the organization’s pedigree and sense of history as well as its vitality and relevance in the present day. Downstairs, MOD executive director Alan Fausel sees his mission as bringing new perception to the art and its subject. Fausel—a French bulldog, per the kiosk—has a Welsh springer spaniel, Gemma, and wears a spaniel necktie. 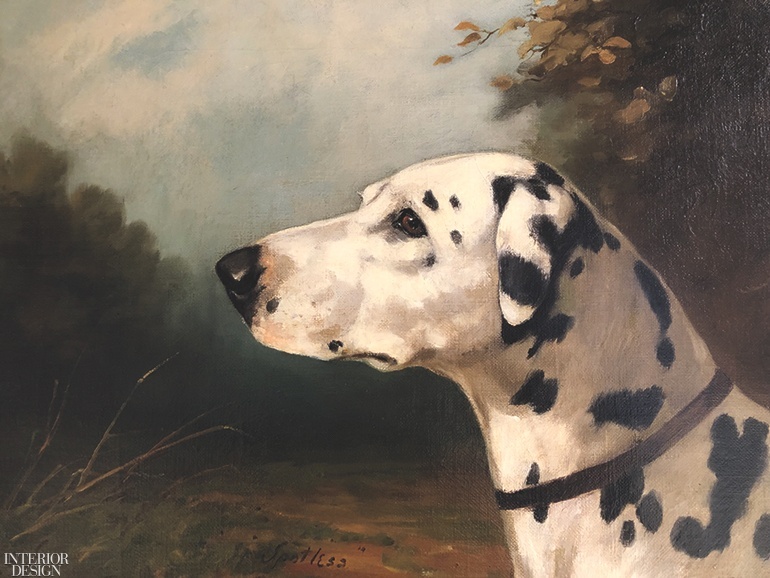 “I’ve started seeing dogs differently, in the art,” he confides. Not having a proper pedestal for Sky, James Gion’s life-size bronze of a reclining Irish setter, the director rested it on a real, quilted dog-bed: part curator, part caring owner. “People love it,” he says. 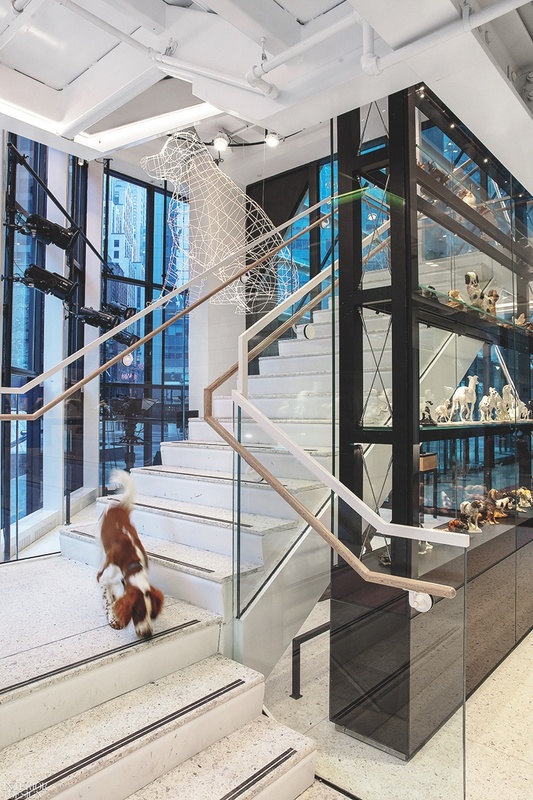 The open stair wraps around a 34-foot-tall custom vitrine showcasing rare porcelains and bronzes of AKC breeds. Photography by Eric Laignel. 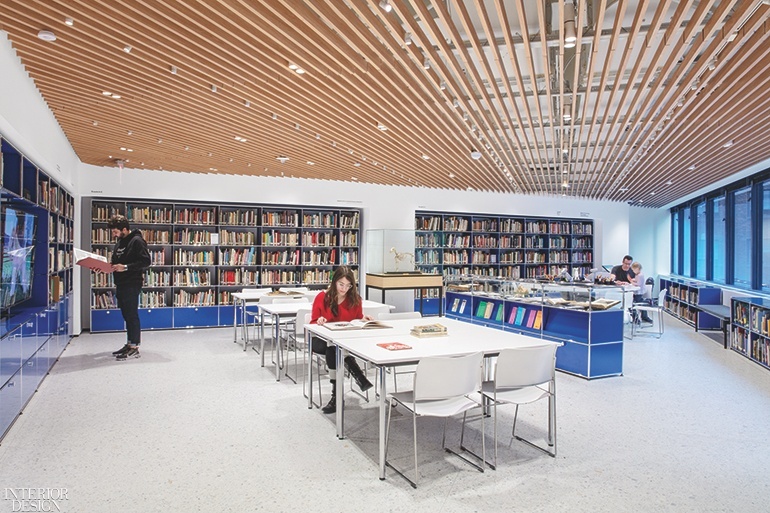 The second floor includes a 4,000-plus-volume library with an arts-and-crafts area. Photography by Eric Laignel. 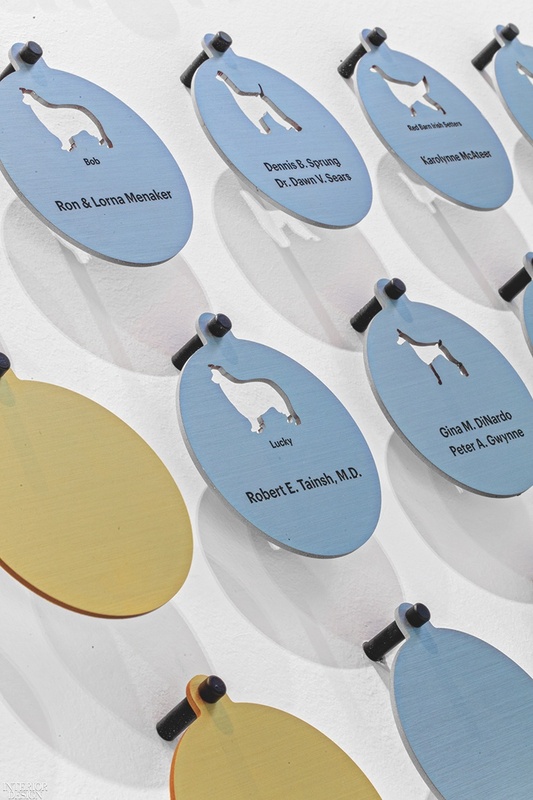 A wall of dog tags in the gallery acknowledges donors and their pooches. Photography by Eric Laignel. A pair of interactive flat-screen displays allows visitors to discover which breed of dog they most resemble. Photography by Eric Laignel. 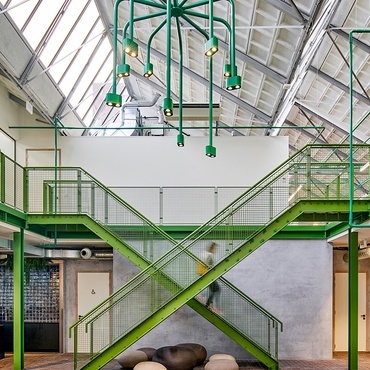 Gemma, the museum director’s Welsh springer spaniel, descends the terrazzo stair, behind which hangs an 8 1/2-foot-tall wireframe Labrador retriever. Photography by Eric Laignel. The oil on canvas I Hear a Voice is by Maud Earl. Photography by Eric Laignel. 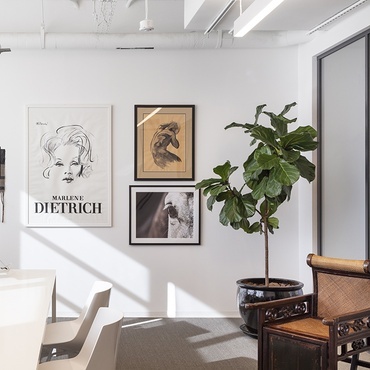 Three floors above the museum is the AKC headquarters, its reception area furnished with a Pierre Renart desk. Photography by James John Jetel. 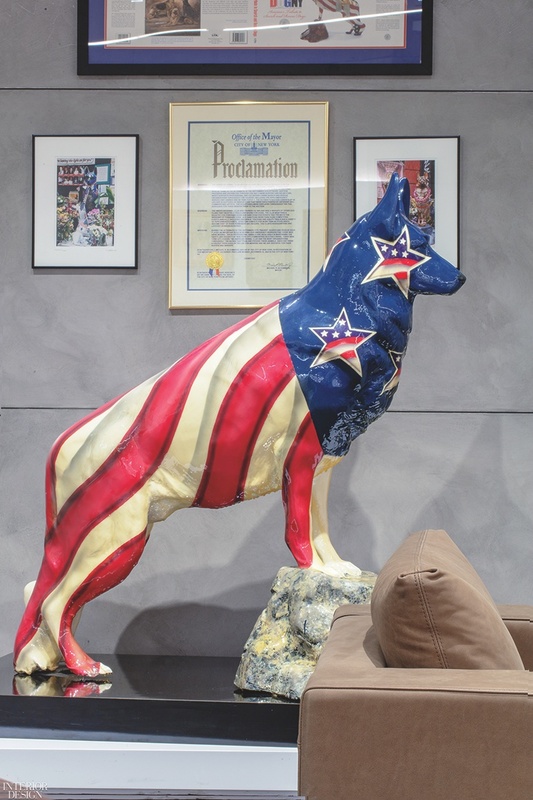 Robert Braun’s bronze German shepherd, commissioned by the AKC for its 9/11-themed art initiative “DOGNY: America’s Tribute to Search and Rescue Dogs,” stands by reception seating. Photography by Eric Laignel. 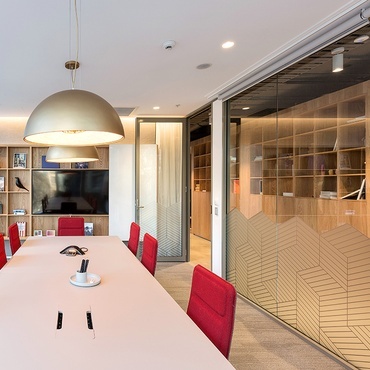 The boardroom’s ceiling grid picks up the triangular motif found throughout the office. Photography by James John Jetel. Off a meeting area, phone booths have doors that evoke traditional British call boxes. Photography by Eric Laignel. Another “DOGNY” German shepherd is by Dean Johnson. Photography by Eric Laignel. 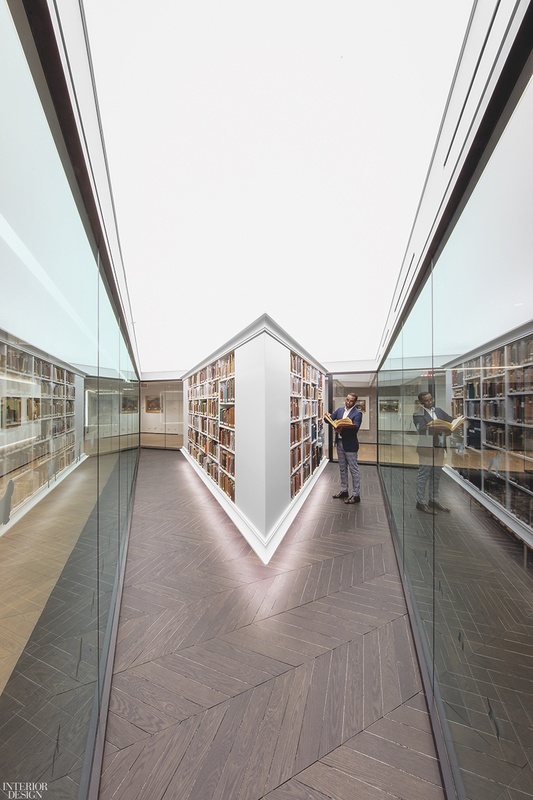 The triangular rare-books room sits at the core of the floor plan. Photography by Eric Laignel. 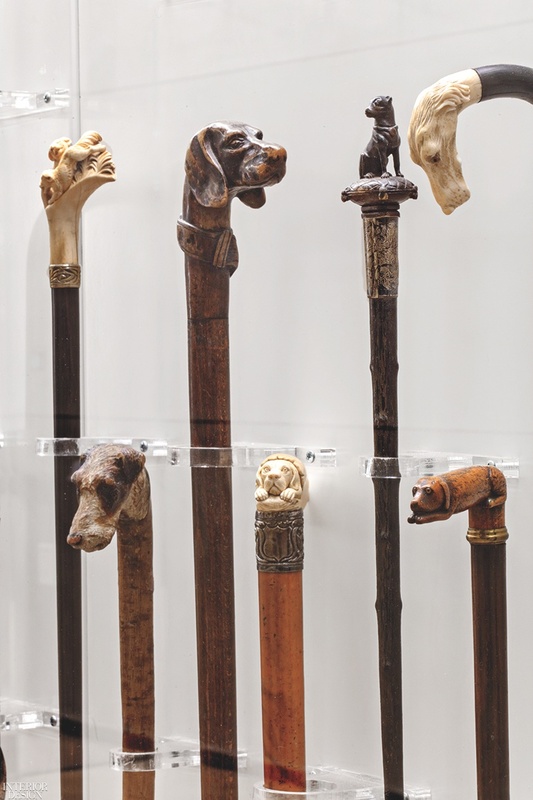 A collection of dog-head canes is showcased in the elevator lobby. Photography by Eric Laignel. Tom Dixon pendant fixtures and a Noé Duchaufour-Lawrance sofa furnish the café. Photography by Eric Laignel.